Around 400 A.D., Polynesians journeyed in canoes to Hawaii, becoming the islands' first human inhabitants. 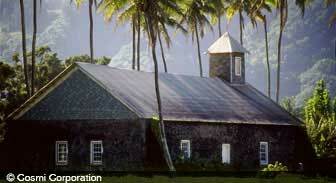 Tahitians followed centuries later, creating the basis of Hawaiian culture. But Hawaiians incorporated aspects of numerous immigrant cultures which came later, creating a blend of South Pacific, Asian, and Western traditions. Captain James Cook's discovery of Hawaii in 1777 paved the way for an influx of foreigners on the islands. Hawaii's attractive position between North America and Asia turned it into a thriving port for European and American ships. At the same time, the great chief Kamehameha united the Hawaiian islands as a single kingdom. Due to a problem with rampaging wild cattle, a group of Mexican cowboys were recruited to teach Hawaiians their skills. Later, sugar plantations boomed, and large numbers of immigrant workers came from China, Japan, Portugal, and the Philippines. Smaller numbers of other European and Korean immigrants added to the mix. Although the immigrant population grew larger than the white population, the whites held significant power because they controlled the majority of businesses and wielded great political influence. Struggles between whites and the Hawaiian monarchs led to the overthrow of Queen Lilioukalani by American business interests in 1893. Hawaii became a United States territory several years later. The 1941 attack on Pearl Harbor was a watershed in the history of both Hawaii and the United States. Hawaii fell under martial law during the war, greatly restricting the freedoms of its residents. After the war, tourism began to surpass the plantations in importance. U.S. statehood, granted in 1959, ended the political control of plantation business interests for good. Hawaii's representation finally reflected the state's diverse ethnic makeup. As tourism continued to increase, Hawaiians revived traditional practices like hula dancing. Rediscovering their heritage renewed interest in reclaiming land for traditional Hawaiian homesteading. The generous, welcoming people of Hawaii make travelers feel right at home. Whether exploring the restored City of Refuge, soaking up the sights and sounds of Honolulu's Chinatown, or experiencing the tranquility of a Buddhist temple, visitors will enjoy the pastiche of cultures which makes Hawaii so exceptional. The history of Hawaii is an interesting topic for many travelers. Want to learn more about what to expect from the culture of Hawaii? Be sure to check out our helpful article.